One of my research projects concerns Otto J. Klotz, a German-Canadian surveyor in the 1870s and 1880s. Klotz is not well-known today, but he left a rich personal diary with an entry for every day of his adult life. He was involved in creating the property grid of the Dominion Land Survey on what would become the Canadian Prairies, and would later go on to become Canada’s top astronomer. I say “what would become the Canadian Prairies” because the prairies Klotz first encountered were not Canadian: the majority populations were Indigenous, Indigenous nations were politically and militarily powerful, and the primary languages spoken were Indigenous languages including Michif (the language of the Métis). The eventual dominance of the Canadian state was still far from certain. 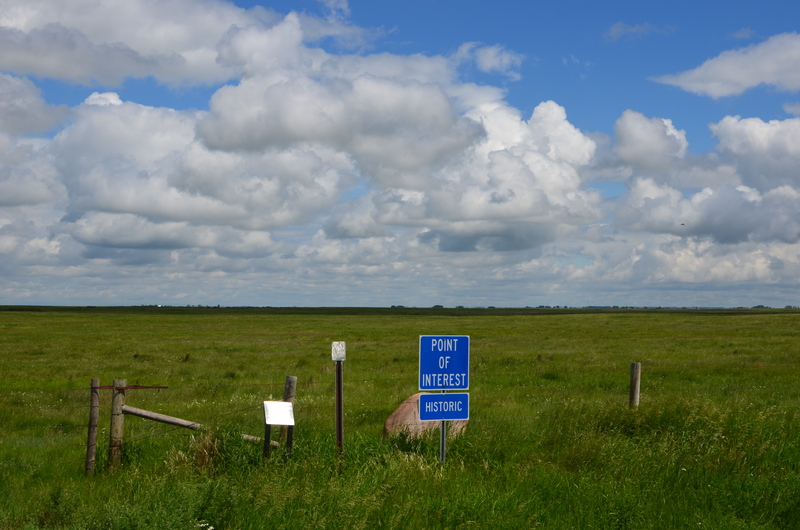 It was surveyors like Klotz, along with police officers, railway engineers, and Indian Affairs officials, who made the Canadian state a reality on the Prairies. This summer I have been mapping out Klotz’s travels, as a way to better understand Canadian colonization of the Prairie West. The above image is a screenshot I took while using GIS software to trace out the cart trails that crisscrossed the northern Prairies in the 1880s. Using Klotz’ professional surveying notebooks, it is relatively easy to spatialize his travels for the days when he was working to create the Dominion Land Survey (the rectangular property grid that covers the Prairies from western Ontario to parts of British Columbia). His notebooks give his geographical coordinates for every day he was in the field, but not for the days when he was traveling to and from his worksite. Using only Klotz’s diaries and notebooks there was no way to precisely map his travels. His diaries sometimes indicate which cart trail he traveled, but those cart trails no longer exist, and I needed to find where they used to be. Thankfully I was able to find some high quality digital images of Northwest Mounted Police map and a Dominion Lands Survey map from the 1880s that showed cart trails (thank you University of Alberta libraries! ), then georeferenced them, and began to trace out the trails. This screenshot shows a work in progress along with a georeferenced DLS map of eastern Manitoba and western Ontario. For the purposes of orienting the viewer, the purple lines are largely focused on Manitoba, and the yellow lines on what is today Saskatchewan and Alberta. The network of trails revealed by the image shows that the pre-railroad land transportation network was well-established and wide-spread, and that certain places that are ghost towns today (like Fort Elice, the busy node where maroon and yellow lines meet) were central transit hubs 130 years ago. When I complete this work, I will provide the University of Alberta libraries with the georeferenced maps and shape-files for the cart trails so they can be made available to other researchers. With few traces of these trails remaining on the ground, this will help us to better understand life on the Prairies before and during colonization. 2013 photo of a historical plaque in Southern Saskatchewan marking the location of the Weyburn Cart Trail. This entry was posted in Uncategorized on September 10, 2013 by Daniel Rueck.